After Addi passed away a couple of weeks short of her second birthday, her mother Amber Bender decided she wanted to help other families battling pediatric cancer. Amber and Tony Bender founded Addi’s Faith Foundation in April 2007 and have since raised funds to provide financial assistance to families of children who have cancer and to fund research at MD Anderson Cancer Center in the Houston Medical Center. Amber serves as executive director of the Kingwood-based organization. Addison Faith Bender, known as Addi, was diagnosed with an atypical teratoid rhabdoid tumor when she was 17 months old and did not leave the hospital for three months after her initial MRI. She said the family was fortunate that Tony’s employer was flexible and willing to work with them during their daughter’s illness. Meanwhile, Amber was a stay-at-home mom and was able to care for Addi. Taking care of a child with cancer is an around-the-clock job, and often one parent has to quit his or her job, Amber said. At a time when a family’s financial demands have increased due to medical bills or from travel expenses to and from treatment, their income decreases. Addi’s Faith allows parents with children diagnosed with cancer to apply for financial assistance online or by mail. Each month the organization’s review board meets, reviews the applications, checks their confirmation letters and sends out what funds it can to families in need. The foundation did just that for Tiffany Williamson when her son Ethan was diagnosed with bone cancer in 2014. As an 8-year-old at the time of his diagnosis, Ethan was an honoree for Addi’s Faith’s Walk By Faith 10K/5K Race. The nonprofit supported the Williamson family emotionally and financially as Ethan underwent treatment for about a year until he was declared cancer free in April 2015. The organization’s other main objective is to fund pediatric neuro-oncology research. Amber said most of the funding for the research of childhood cancers comes from organizations like hers in which parents have lost a child and decide to take action. So far Addi’s Faith Foundation has given over $800,000 of the $1.5 million it has pledged to MD Anderson. The pediatric neuro-oncology research lab there is named in Addi’s honor and is in Phase 2 of a clinical trial that uses cells that were removed from her tumor. The organization makes quarterly payments to the hospital so the research can continue without having to wait for more funding. The foundation also provides scholarships to children who have survived brain tumors and supports an organization, Holley’s Hope, that provides grief support for parents whose children have died. Amber said that although the scholarships are a small part of what the organization does, the scholarships offer some hope and encourage parents and children who are currently facing the disease. Addi’s Faith hosts several events to support families dealing with childhood cancer and cancer research. Visit www.addisfaithfoundation.org to learn more, donate online or sign up for the email newsletter. Send donation checks to 2410 Riverway Oak Drive, Kingwood. 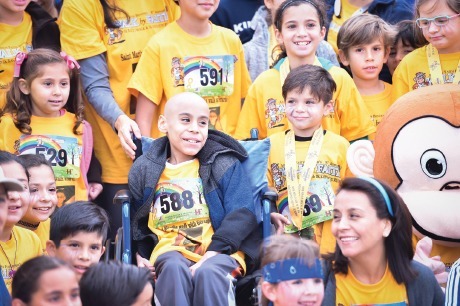 Attend Walk by Faith 10K/5K Race on Nov. 12 at the University of Houston. Attend the AddiShack Charity Golf Tournament held each spring.